It has become conventional to represent the diversity of varieties of English in the form of three concentric circles (an idea introduced by the linguist Braj Kachru in 1985). 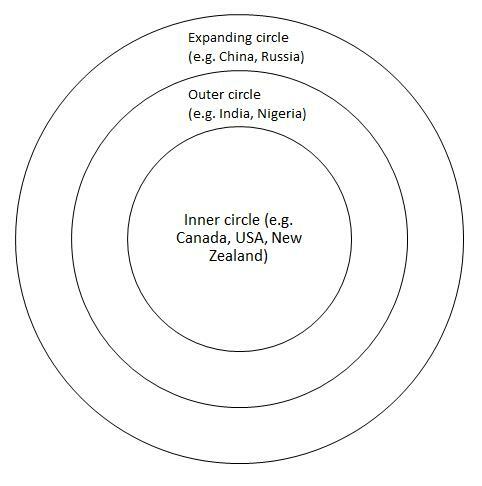 The English of the ‘inner circle’ is essentially that of native speakers, used by members of the dominant culture: the English, that is, of countries such as the United Kingdom, the USA, Canada, Australia, and New Zealand. At the end of the twentieth century there were about 400 million native speakers of English in the world, or just over 5.5% of the world’s population. The second or ‘outer’ circle consists of areas where English is widely learned and used as a second language. This typically includes countries, such as India and Nigeria, that were once under British rule, and in which English often acts as a communicative bridge between communities that speak different indigenous languages. Beyond this there is the so-called ‘expanding circle’, encompassing all those who learn and use English, with varying degrees of expertise, as a foreign language. This expanding circle has been the great growth area of English since the middle of the twentieth century. It has become the world’s lingua franca for business and technology, an essential tool for trading negotiations, academic interchange, and electronic communication between those who do not have a native language in common. So crucial has this role become that several attempts have been made to develop an artificially simplified form of English that would be easier and quicker for foreign learners to master. The most high-profile of these is probably ‘Globish’, created in 2004 by Jean-Paul Nerriere, which uses a subset of English grammar and has a vocabulary of 1,500 English words (not too different, in concept and form, from the ‘Basic English’ devised in the 1920s by the linguist C.K. Ogden with the aim of facilitating international communication). It is hard to give a precise figure for the number of people who occupy the third and last circle of English, but it has been estimated that at the beginning of the twenty-first century, English speakers and users of all three categories account for between 20 and 25 per cent of the world’s population.